MOSCOW (Sputnik) - Astronomers researching the Hubble Space Telescope observations discovered a galaxy lacking dark matter, NASA said in a statement. Scientists consider dark matter the material that holds stars and gas in galaxies together. "NASA's Hubble Space Telescope took an image of a bizarre, ghostly looking galaxy called NGC 1052-DF2 that astronomers calculate to have little to no dark matter. This is the first galaxy astronomers have discovered to be so lacking in dark matter, which is thought to comprise 85% of our universe's mass," the Wednesday statement reads. 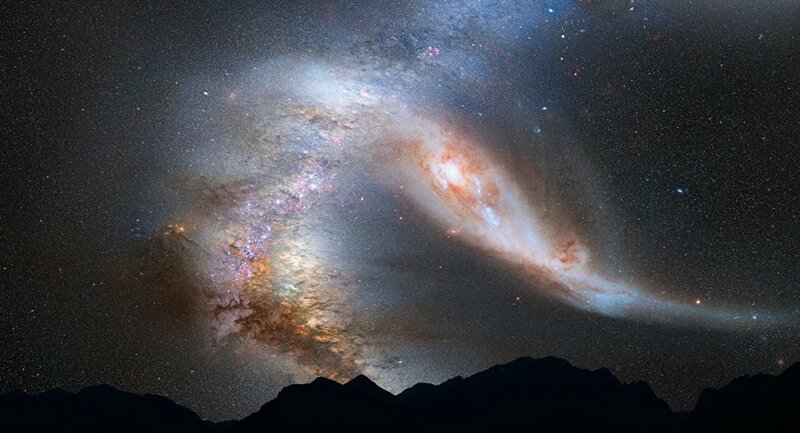 NASA specified that the galaxy has around one four hundredth of the expected amount of dark matter. NGC 1052-DF2 is considered to be some 10 billion years old. Dark matter does not emit electromagnetic radiation, and remains immune to direct observation. Astrophysicists have so far only observed the gravitational effects of dark matter on cosmic objects, such as galaxies and galaxy clusters. Indirect observations include searching for excess gamma ray emissions, which may be the product of weakly interacting massive particle (WIMP) decay. The theoretical WIMPs are thought to be the main component of dark matter. Visible matter has been calculated to account for only 4.9 percent of the universe's matter and energy distribution, with dark matter accounting for 26.8 percent.